The best New Year's Eve of your life is waiting at the Sydney Opera House this December. Dress up to the nines, kick up your heels and leave the crowds behind as you stroll towards the iconic sails. Enjoy a magnificent pre-performance dinner or a few drinks overlooking Sydney Harbour before you take your seats for the performance. Choose between a sumptuous production of Puccini’s La Bohème or the Opera Gala, where you’ll hear some of our finest performers join with the 60-piece Opera Australia Orchestra for a concert of some of opera’s most impressive arias. You can enjoy the 9pm fireworks during the interval for both events. After the show, make your evening even more special with tickets to our exclusive Midnight Party. Held in the Northern Foyers of the Opera House, this event includes drinks, canapés and entertainment — and of course, a great vantage point for Sydney’s famous NYE fireworks. There’s nowhere in the world like Sydney on New Year’s Eve, and there’s nowhere closer to the action than Sydney Opera House. So go on, make this your most glamorous New Year ever. If you don’t have tickets to the Midnight Party, there are a limited number of outdoor viewing areas you can access following the performance. Please note that these spaces are limited and cannot be guaranteed. Some fireworks are visible from the Southern Foyers inside Sydney Opera House at midnight, but you may not have a view of Sydney Harbour Bridge. Add pre-performance dinner and/or the Midnight Party after you've selected your tickets for the Opera Gala or La Bohème. Look out over Sydney Harbour as you dine on a three-course menu, matched with premium wines and beverages in the Northern Foyer from 5:30pm. Canapés, drinks and live entertainment, with views of the spectacular midnight fireworks on Sydney Harbour. Please note that while the foyer offers a good view of the fireworks, space outside on the balcony will be limited. Pre-performance dinner, Platinum seats at the performance of your choice, a program, drink at interval, and the Midnight Party. Choose Platinum Package seats when booking online, or call our Box Office +61 2 9318 8200. If you select Platinum seats, there's no need to add pre-performance dinner or the Midnight Party to your cart. Leave the crowds behind as you enter the Sydney Opera House, then settle back for an evening with the bohemian friends in Puccini's La Bohème. 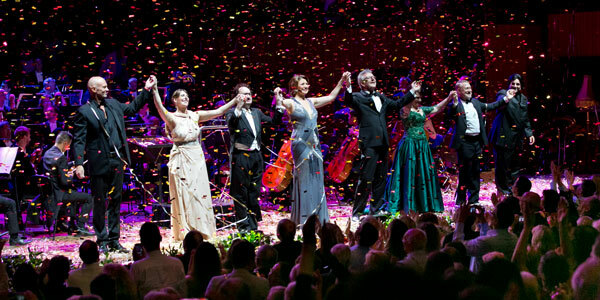 Step into the Sydney Opera House's magnificent Concert Hall to watch the Opera Gala concert of popular arias by Verdi, Puccini, and Rossini, with fireworks and champagne at interval.